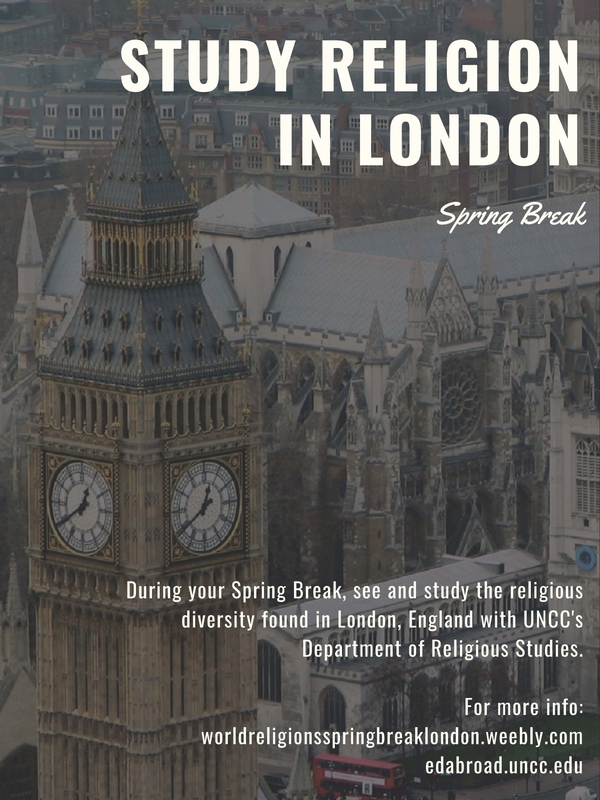 During Spring Break, students will travel to London, an ideal microcosm for the study of religious practices, symbolism, and spaces of people in multiple religious traditions. Site visits will include several major and minor Christian churches as well as a Sikh gurdwara, a Jewish synagogue, an Islamic mosque, a Hindu temple, and a Buddhist meditation center. Students will experience a Roman Catholic Mass in Latin, explore a crusader church, enjoy a lunchtime chamber music concert in a historic church, and visit a Victorian garden cemetery. A day trip will allow students to experience Stonehenge, Salisbury Cathedral, and the Roman city of Bath. Students will come away with an appreciation of the complexity and beauty of different worldviews living side by side. Apply by November 1, 2018. The Department of Religious Studies is able to offer a $250 scholarship to the first ten students to fully complete the application process and confirm their participation.